I love brie in puff pastry. It is one of my signature appetizers to serve at parties at our house. When it comes out of the oven our friends and family decent upon it like hungry vultures. They can devour a large wheel of brie en croute faster than you can ever imagine. This does however pose some problems. First of all, the serving plate is only so big. There is a limited amount of space for people to gather around it fighting for melted cheese. 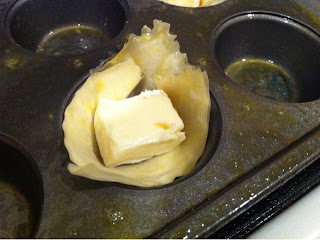 Second, it can be difficult with a large puff pastry to get the right ratio of pastry to brie to filling. Third, it can get messy. Cheese and filling end up everywhere and peoples hands leave sticky marks all over. This little baby solves all those problems. I saw them on Pinterest (via PlainChicken.com) months ago and I finally got around to making them for Justin and I's tapas style Valentine's dinner this week. 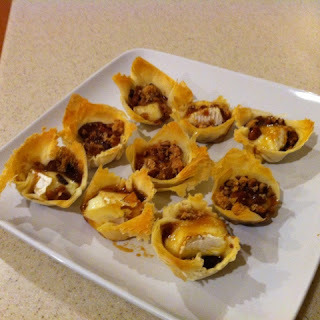 I based mine on the original recipe just using what I had on had (I did not buy phyllo mini tarts as suggested, I just made my own from the scraps of phyllo dough I had in the fridge left over from Lightened Up Chicken Pot Pie). I left the pecans out of this one to see which I liked better. Pecans won. They were exactly as I imagined them: the perfect ratio of cheese to phyllo to sweet filling. They were surprisingly easy and I can imagine that you could make all kinds of adaptations of them. 1.) Lightly spray a mini muffin tin with cooking spray. 2.) Cut phyllo dough into 1 1/2 inch squares. 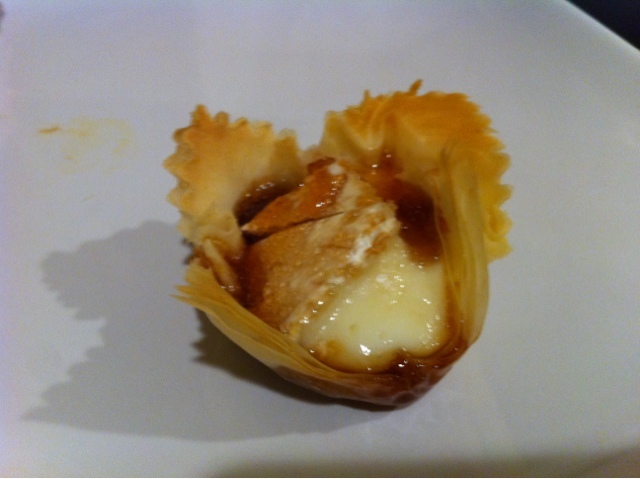 (I used a pastry cutter). You could also use the pre made tarts. 3.) 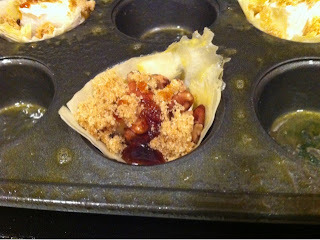 I used about 4-5 layers of dough for each tart and pressed it into the muffin tin. Lightly spray the dough with cooking spray so it doesn't burn. Please excuse the excess of cooking spray on the tin. 4.) Place a cube of brie in each piece of dough. 5.) Top each one with 1/2 teaspoon of brown sugar, 1/2 teaspoon pecans and a little drop of honey. 6.) Bake at 375 degrees until cheese is melted and dough is golden brown. 7.) Let them cool for a few minutes before removing them from the pan. I used a spoon to help me lift them out without breaking the shells. 8.) Watch them disappear! Enjoy! Sweet pecans and brie?!?!?! You've grabbed my interest with that combo. These looks scrumptious! Very creative idea! Yum. 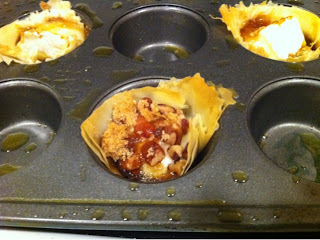 I wonder if you could make these in mini muffin tins which I love to use? May try it someday. Thanks for posting. I actually did use the mini muffin tin. Sorry I forgot to mention that! Um these look absolutely divine! thanks so much for linking up. These are awesome little treats! This is a great recipe. Thank you so much for sharing with Full Plate Thursday and have a great week end. Oh yum! that looks great! These look amazing. I've never been adventurous with cheese and I must admit I've never tried brie but this looks so good I probably will now. Thanks! What a fun recipe! I've found so many delicious things on pinterest! So glad you chose this recipe to share! YUM! What a perfect little appetizer. It looks delicious! Thanks so much for sharing! Just stopping over from Eat Pray Read after your recipe was featured there. All I can say is YUM, I have added these to my list of must makes. I'm a new follower and these look so delicious! I can't wait to try them myself. Definitely going in the recipe list! These look SO tasty! Thanks for sharing at oopsey daisy! 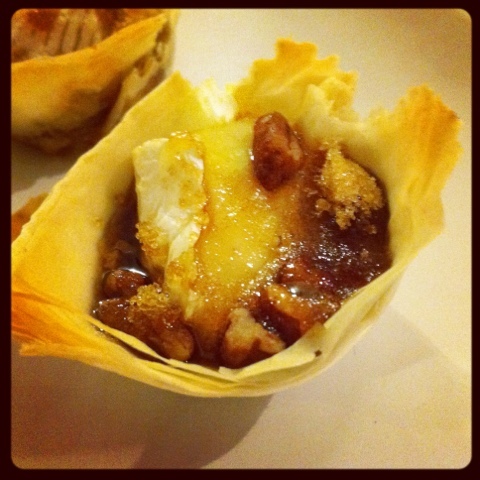 I love brie, especially warm and with sweetness and nut too - yum! Happy Leap Day & End Of The Month Reminder!